Advanced Gauging Technologies has just completed the startup of a new AGT800 Pipe and Pole System at McWane Ductile in Coshocton, Ohio. 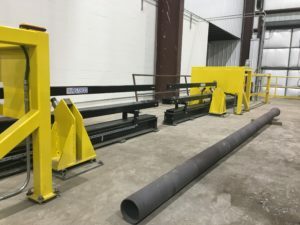 They produce cast iron pipe and poles up to 16 feet long and this is the second system they have purchased in the last two years. This is a unique application that uses two opposing C-frames to oscillate in and out opposite sides of the pipe being inspected. Our system, installed after the pipe and pole cast line, will be used to accurately measure wall thickness. A.G.T. understands no two customers are the same, and because of that we have put a focus on being able to provide custom solutions for applications such as this.